New D6T, D7E and D8T models from Caterpillar build on the solid, proven designs of their predecessors with new features that increase fuel-efficiency and productivity while reducing operating costs. All three models feature Cat engine and aftertreatment solutions to meet US Environmental Protection Agency Tier 4 Interim emissions standards. Integrated emissions control The D6T and D7E use the Cat C9.3 ACERT™ engine and the D8T uses the Cat C15 ACERT engine, having net horsepower ratings of 205, 235 and 310 respectively. These engines utilize the building blocks of ACERT Technology, including the Cat NOx Reduction System and Cat Clean Emissions Module (CEM), to meet Tier 4 Interim emissions standards. ACERT Technology blends an innovative intake-air-management system, using optimized turbocharging, with electronically controlled fuel-injection that precisely shapes each combustion cycle through multiple-injection fuel delivery. This meticulous control of combustion parameters yields extremely clean combustion, steady power in all operating conditions and outstanding fuel efficiency. The Cat NOx-Reduction System continually diverts and cools a small volume of the engine exhaust gases and then returns the cooled gases to the combustion chamber. This process reduces cylinder temperatures and, consequently, lowers NOx formation. The CEM, a compactly packaged aftertreatment unit, includes a Diesel Oxidation Catalyst (DOC) and a Diesel Particulate Filter (DPF) to remove particulate matter from the exhaust stream. Also included is the Cat Regeneration System (CRS) – a process that removes soot from the Diesel Particulate Filter (DPF.) Under most operating conditions, engine exhaust is hot enough to oxidize soot through a passive regeneration process. However, if conditions are such that supplemental regeneration is needed, the CRS elevates exhaust gas temperatures to oxidize soot within the DPF. The Cat Regeneration System is designed to work transparently, operating automatically without any interaction needed from the operator and regenerating when conditions are optimal. The D6T, D7E and D8T each offer optional Key Off Regeneration, as well as a delayed engine shutdown timer and an engine idle shutdown timer. For high debris applications that require thermal shields on exhaust components, an optional insulated CEM will be available in mid-2011. All three new tractor models are Grade Control Ready, with integrated harnesses incorporated into the machine during assembly. This allows for easy dealer installation of an AccuGrade™ machine control and guidance system when the machine is purchased or later as business requirements change. Ground level service centers provide access to battery disconnect and engine shutdown switches as well as optional lighting switches without having to set foot on the machine. New lighting packages, steps and grab bars provide easier machine access/egress. New cab interiors that are easier to clean, as well as streamlined dash displays and instrumentation, enhance operator efficiency and provide more commonality across the tractor line-up. ll three models also offer Cat Product Link*, which allows remote monitoring of equipment to improve overall fleet-management effectiveness. Product Link is integrated into machine systems. Events and diagnostic codes, as well as hours, fuel, idle time and other detailed information are transmitted to a secure web-based application, VisionLink. VisionLink includes powerful tools to convey information to users and dealers, including mapping, working and idle time, fuel level and more. The Cat D6T is engineered for day-in/day-out demanding work. Standard electro-hydraulic controls improve precision and response and facilitate installation of the Cat AccuGrade™ machine control and guidance system, which saves fuel and time by helping operators attain specified grades in fewer passes. The D6T hydraulically driven demand fan, operating only when necessary, works in concert with an all-new cooling package and advanced electronic engine controls to deliver fuel savings of as much as 6 percent, depending on the application. For even greater fuel economy—as much as 3 percent better—the D6T features an Eco Reverse Mode that reduces fuel consumption when the tractor reverses. A new steering tiller, similar to that in the D7E, provides the convenience of a forward-reverse rocker switch, thumb wheel control for ground-speed and carry-speed button, which allows engaging a pre-set speed for carrying a loaded blade. The Cat D7E remains the most innovative track-type-tractor available, featuring a diesel/electric drive system for unprecedented efficiency and productivity. D7E users are experiencing superior reliability and fuel efficiency on their own jobsites—often even better than the 10 to 30 percent fuel advantage over the D7RII as measured in production studies. The new D7E features an Eco Reverse mode for even greater fuel efficiency, and a dual tilt blade option can improve dozing productivity. By using less fuel and a smaller volume of drive-train lubricants, coupled with extended service intervals, the D7E can lower lifetime operating costs as much as 10 percent, compared with the D7R II. And as with all Cat Track-Type Tractors, the D7E major components are designed to be rebuilt, economically extending the productive life of the machine, significantly lowering lifetime owning and operating costs—and providing optimum return on the machine investment. The new D8T builds on a reputation of exceptional quality and performance, retaining such premium features as differential steering for infinitely variable turning control with full power to both tracks and a suspended undercarriage for optimum traction in uneven terrain. Additional new performance-enhancing, cost-reducing features, include an Enhanced Auto-Shift system that can reduce fuel consumption as much as 6 percent in certain applications. An all-new cooling system incorporates a single-unit coolant radiator, hydraulic-oil cooler and air-to-air after-cooler positioned in an easily serviced single-plane design. Complementing the new cooling system is a ROPS-mounted air-conditioning condenser that is protected in high-debris applications. 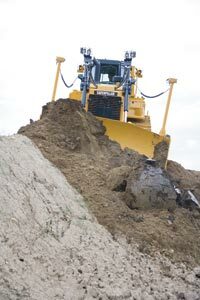 The D8T will be available with a new Cat Grade Control option beginning in mid-2011. This factory-integrated machine control and guidance system guides the blade to the desired design contours and enhances overall machine productivity with features like AutoCarry™, Automatic Ripper Control, Auto Blade Assist and Grade Protection. For more information about the new D6T, D7E and D8T, please call Kelly Tractor at (305) 592-5360.